bryn alexandra: Finally, a new entry light! Finally, a new entry light! My MIL has suggested many times that I should just take it down, spray paint it and put it back up until I can get what I want. But I live in the camp of "I'm not going to do it until I can do it right" (I'm a stubborn Taurus, that's for sure). Charlotte always like to be a part of the action. I got mine from Worlds Away (to the trade). If you are interested in purchasing one, email me! We also tried to install this IKEA pendant in our laundry room but it just didn't work out (we need more of a flush mount). Too bad, it's SUCH a good looking light and the price is amazing. I'll just admire it from afar in Erika's kitchen. Once we get a new light installed in the laundry room I'll do a full details + sources post! The capiz light looks really great in your entryway! Love it!!! It's so simple, yet totally eye catching!!! That's one of my favourites - it looks beautiful! I'm always surprised (and pleased) when I manage to DIY something tricky like that - it gives you a great sense of accomplishment. Nicely done! Gasp...the light is stunning! Oh you are so lucky with the Joss and Main win they look perfect in that spot! I adore this light - absolutely worth the wait! Oh wow! That's beautiful! I put that Ikea pendant in my hallway. Love it! Hooray!! It looks awesome, good job DIYers! I love it!!! Would you share who the light is by? Love it, it looks amazing in the space! 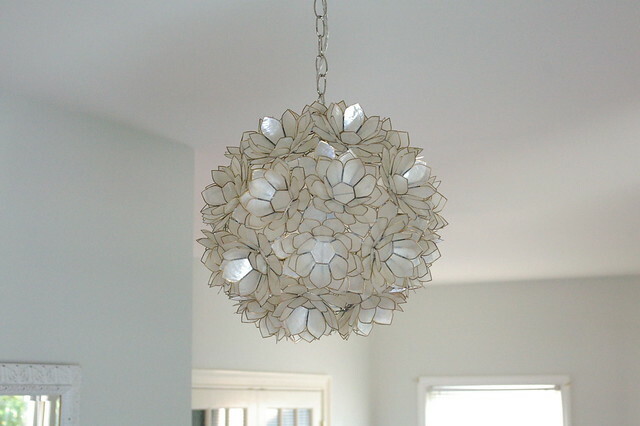 LOVE your light fixture! Also... I'm loving your vase and branches in the entry. Can you share where you got that vase and what type of plant that is?? Bryn - it's beautiful! I love how it looks in the space. And funny about the Ikea light fixture - I suggested it to a client and have been trying to figure out how to use it in a design since! Love love love it! I have wanted that light for over my eat in kitchen table since I moved in my house over a yr ago. My hubby is not so keen on it though. Especially the price tag. :-( I think it is worth every penny! Looks fabulous! I have always loved this light too! It looks great there! SO pretty! Will you take a shot when it's all lit up and glowie? ( my word) I'd love to see what it looks like at night. Thanks! This looks great Bryn! I can't wait to see more photos of your house! Hello! So great to see your post! We heard you'd used our Venus-Lotus pendant! Such great pictures! Looks lovely!! Ive always liked that pendant! The new like looks amazing, Bryn! So funny about the chair! Ha! I meant light, not like! That capiz lotus pendant is so gorgeous that it makes me ache. I'm dying of envy over here! i LOOOOOOVe the lotus pendant! it fits perfectly in your home. Great addition! what a great addition! 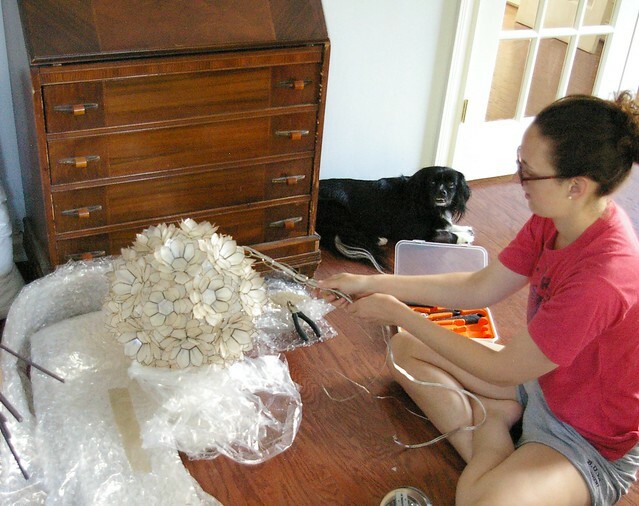 and lucky you to have a hubby that is willing to "learn on the job" how to install a light fixture for you. it looks beautiful! 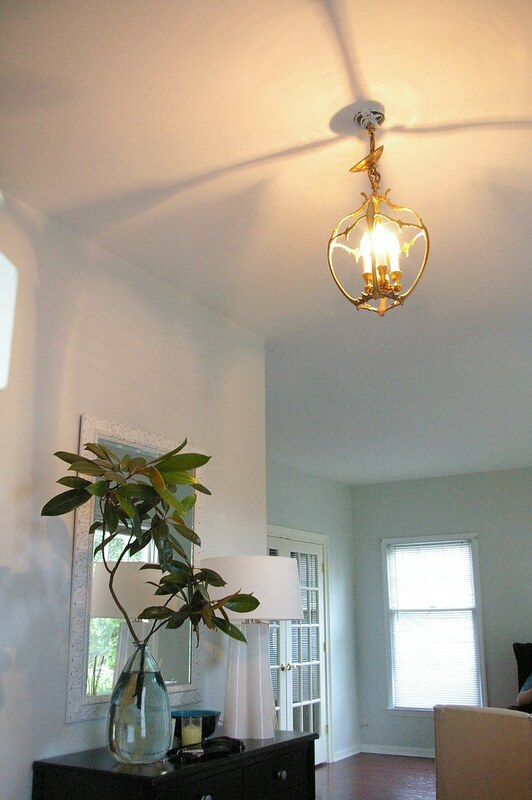 Love the light fixture...for a little whimsey! 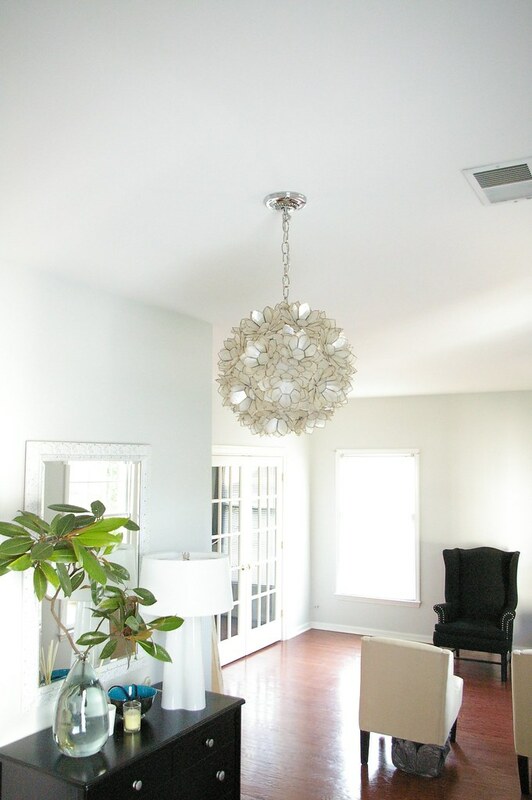 That new fixture looks fabulous in your house! I have always loved it, but don't feel it will work in my foyer, but I may reconsider!